1933 postcard: What the king conquered, the prince shaped, the field marshal defended, the soldier rescued and united. 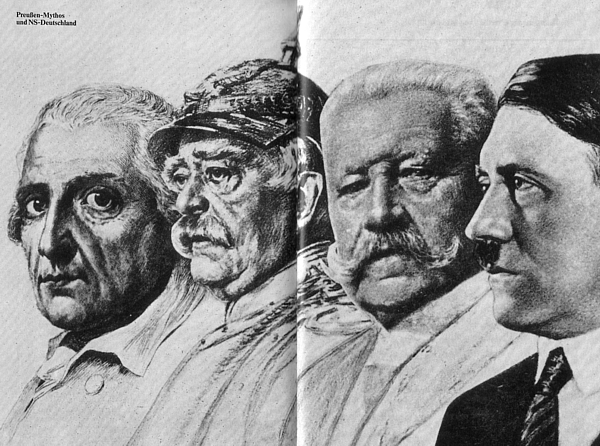 Guiding question: How is Germany's history different from other countries' histories? Since the projector wasn't working on Wednesday, I took the first part of today's lecture to show and review the images from the Lecture 2: "What is Germany?" (they are in that web page). 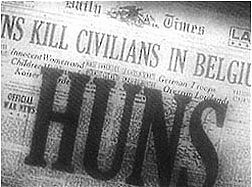 Then I showed the first 20 minutes of the 1945 US Army film Here is Germany, which was made to prepare soldiers who had not seen combat to go to Germany for the US occupation after the May 8, 1945 unconditional surrender. The film was, however, never used for its intended purpose. See my brief summary of Here is Germany, below. The 52-minute film, directed by Frank Capra, can be purchased on DVD for $15 at International Historic Films. The film is available on the Internet Archive. Since Oct 2007 the film has been available on Youtube, in eight 6-7 minute segments (by omgim50): segment 1, seg. 2, seg. 3, seg. 4, -- you'll find the rest in the "related videos" column on the right. Other Youtube versions by HistoryVideos101 (Aug. 2008): segment 1, seg. 2, seg. 4. etc., and by parcans, also Aug. 2008: playlist of all 8 segments. "Here is Germany" wikipedia page, begun in April 2007 by bellorophon. I will present the lecture on Germany's "special paths" next Wednesday (after the Monday MLK day holiday). Note that this film presents arguments drawing on several of those "special paths," but mainly the long tradition of militarism and obedience to authority. people: "clean and tidy," "educated," "musical," "industrious"
mailman, farmer, cop: just like the folks back home? They look like the kind of people we can understand -- or can we? Puzzle: how to explain the contrast between the "clean, industrious people" and these horrors? Let's look deeper into the German character: What makes Germans so? Germans/Hitler would answer "in their blood,"
11:40: "I begin by taking. I shall find scholars afterwards to demonstrate my perfect right." Clausewitz, in his book Vom Kriege (About War): "Just as Prussia has been fated to be the core of Germany, so Germany will be the core of the future German empire of the west." "Conquered people should be left with nothing but their eyes to weep with." 14:10: "Never may a scrap of paper come between me and my subjects!" "Those remaining were molded into mindless automatons." "Great questions of the day will not be decided by majorities, but by iron and blood." 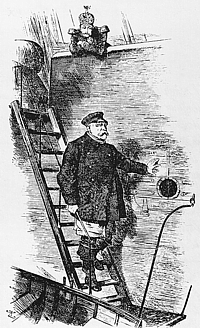 "As soon as anybody can show me that it is sound policy, I shall be equally satisfied to see our troops fire at the French or the Russians, the English or the Austrians." 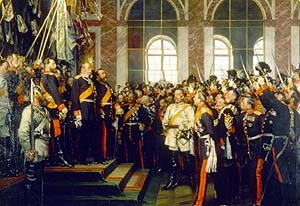 1866-1871: In three wars (against Denmark, Austria, and France) Bismarck creates the "second Reich" "from above"
17:30: The Prussian king is crowned German emperor. "Germany's symbol is Victoria (shown atop the Brandenburg gate), NOT the liberty bell, NOT the magna carta, NOT liberté, egalité, fraternité." "The myth of Prussian superiority became the myth of the master race." Was this a reason of optimism?? "Carl Schmidt" never saw an occupying army, but rather an armistice instead of an unconditional surrender. Why should he accept the shameful treaty of Versailles? He blamed the men who signed the peace treaty. How to ensure that it won't happen again? ends to the strains of Beethoven's "Ode to Joy"
Postcard from ca. 1934 showing 4 German leaders in the tradition of Mt. Rushmore (begun 1927, Washington 1934, Jefferson 1936, Lincoln 1937, Roosevelt 1939; see Nat'l Park Service history). 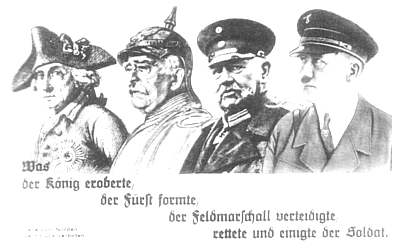 "What the king [Frederick the Great] conquered, the prince [Bismarck] shaped, the Field Marshal [Hindenburg] defended, was rescued and united by the soldier [Hitler]." lecture 2: What is Germany? ; lecture 4: Germany's "Special Paths"